"After spiking in 2017, new listings receded markedly in 2018. In many neighbourhoods, despite fewer sales from a historic perspective, some buyers still struggled to find a home meeting their needs. The result was a resumption of a moderate year-over-year pace of home price growth in the second half of the year. 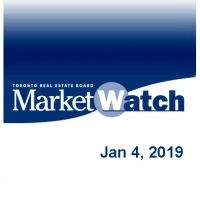 Price growth was strongest for less expensive home types, as many home buyers sought more affordable home ownership options," said Jason Mercer, TREB's Director of Market Analysis and Service Channels.